A mí me gusta Frozen…¿y a tí? Here’s a CI-heavy activity for I like, I don’t like, me too, and me neither. Objective: Get in lots of reps of a mí también & a mí tampoco, modeling when it’s appropriate to respond with each phase. Prep: I made a power point with pictures of things and people that I thought would get a strong reaction from my students. I saved a second copy with the slides set to change at 10 second intervals. In class: I had students make signs that said “Me gusta” and “No me gusta.” I began showing the slides, and had students hold up the sign for their opinion. Oooh, me gusta mucho Frozen. Ashley, ¿te gusta frozen? ¡A mí también! After the first couple of slides, I had students flip their signs over and add A mí también to the back of the Me gusta sign, and a mí tampoco to the back of the no me gusta sign. I then told them that they weren’t allowed to show the same sign as me – if I said I liked it, and they liked it too, they had to show me a mí también, not me gusta. After we finished the slides, I opened up the second powerpoint – the one with the slides on a timer. I designated each student as “Uno” or “Dos,” and instructed them to tell each other their opinions for each slide, and respond with a mí también and a mí tampoco when appropriate. Partner 1 went first, and about halfway through, I had them switch roles. I could have done this with the “official” vocab – verbs like to dance, to eat, to practice sports – but I felt like many of my students don’t have much of an interest in those activities. In my slideshow, I included sports, football teams (I live in the south! ), celebrities, and social media – things that students have strong opinions on! My students enjoyed discussing the images in my slideshow, and engagement was high throughout the activity. I saved two copies of the powerpoint – 1 to click through in the intial presentation, and one on a timer for students to practice with partners. I initially set the timer to 5 seconds, but it was too fast for students to process and respond, so we slowed it down to 10 seconds (the students helped me with the timer – my powerpoint skills are rusty!). I also added a sound effect for each transition during the partner work phase, alerting students that the slide had changed and to discuss the next picture. Pairing Me gusta/A mí también and No me gusta/A mí tampoco on the front and back of the signs worked beautifully – if they showed me gusta when it was supposed to be me too, I just pointed at my sign and back to theirs until they realized they needed to flip it. In this way it was also easy to give quick feedback, even during a whole-class activity. I used this song (which I actually remember from my days as a student in 3rd or 4th grade Spanish!) at the end of the class for more reinforcement of A mí también. You can’t help but chant along with it! I am a teacher, dancer, and Spanish-speaker. This is my place to organize & share my thoughts on teaching, foreign language & language learning. This entry was posted in Class Activities, Sp 1 Unit 3: What do you like to do? and tagged Unit 3 Likes & Dislikes. Bookmark the permalink. 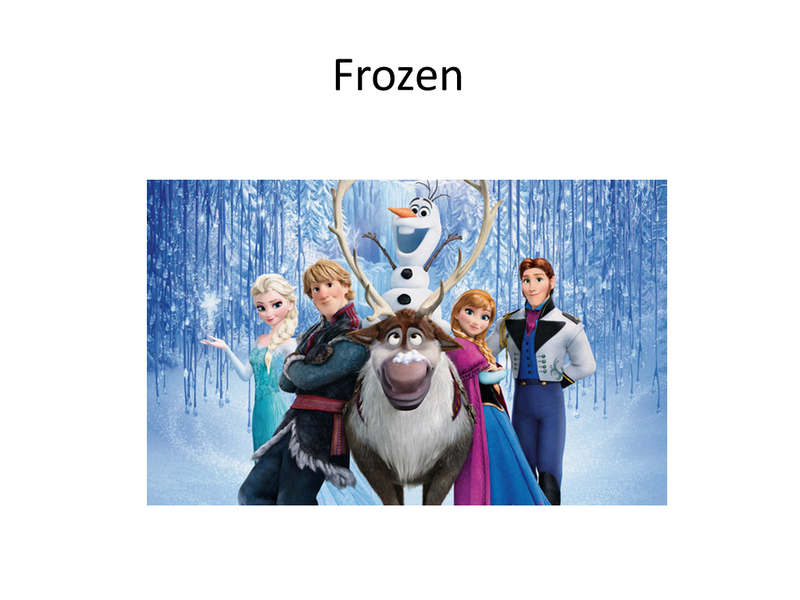 12 Responses to A mí me gusta Frozen…¿y a tí? Can you share with me as well? Looks awesome! I too would appreciate having your PPTs. Thank you for sharing the idea! I would love to have this PowerPoint also. Thank you! I love it! Would you please send me the PowerPoint. Thank You! Buena idea. Can you PLEASE share the PowerPoint. Me gusta. What a cool idea! Would you be willing to share your PowerPoint? I updated it this semester (mostly deleting out of date stuff). Make a copy to edit it yourself, and for timings, use the “Publish to web” option from the file menu.